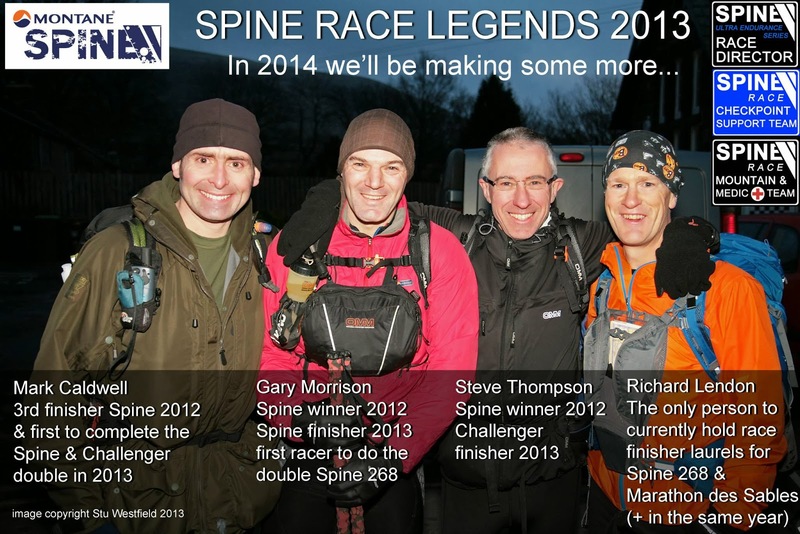 "Spine Race Legends 2013 - In 2014 we'll be making some more..."
But even the Spine Organisation and Staff could not have dreamed the stories of personal achievement, from the first to last man home, that would emerge from 2014.
Who could have foreseen the relentless tenacity shown by Czech athlete Pavel Paloncy, bursting onto the UK Ultra scene and smashing last years 268 mile course record by an jaw dropping 14 hours! Or, Marcus Scotney's successful Challenger mission, nailing the course record by just over 3 hours in a textbook performance. Jon Zeffert coming back for a 3rd attempt, thank God you did it this time Jon! Plus a 3rd Spine finish by Gary Morrison & 2nd Spine finish (to add to his 2012 Challenger finish) by Mark Caldwell. Seeing these two old Spine warhorses crossing the finish line together was, well...you had to be there. Then of course, David Lee, having been holed up in the first refuge hut in 2012, showing abundance of sound mountaineering judgement towards his fellow racers during epic blizzard conditions, returned this year to lay the ghost to rest with a superb finish. When Eugeni proudly carried the Catalan flag to the finish last year, we were all in awe and agreement that his time of 5 days and 4 hours might remain unassailable for several years. 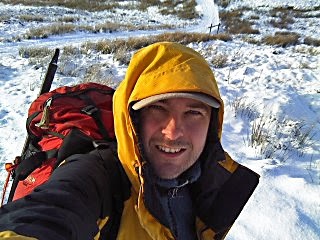 However as 2013 progressed I began to think differently, mainly as a consequence of the navigation and hill skills training courses I was offering Spiners. Looking at Eugeni's primary navigation method (GPS) and the resultant tracklog following error caused by sideways drifting and correction, I calculated he could better his time by at least 6 hours with no extra expenditure of energy. This inspired a curiosity to widen the scope of inquiry to analyse all the elements required of a competitor to firstly, make it to the finish and secondly, how to do this with the maximum possible efficiency. The answers to these questions were clear for anyone to see, one simply had to look at the previous editions of The Spine to see what worked for whom and why. My aim was not to find a "one-size-fits-all how to crack the Spine Race formula". Rather to seek out those methods, techniques and ideas which could be used in combination to help individual Spiners build a 'complete racer' armoury of skills which suited their personal physiology, ambition and capability. I was also interested in why The Spine appeared to sythe through the ranks of talented and big name ultra runners with no respect for previous ability. What I found was that many competitors who would class themselves as an 'ultra racer' had shortfalls in navigational awareness and winter weather hill skills. Perhaps many have become used to way-marked courses or events in more temperate conditions. 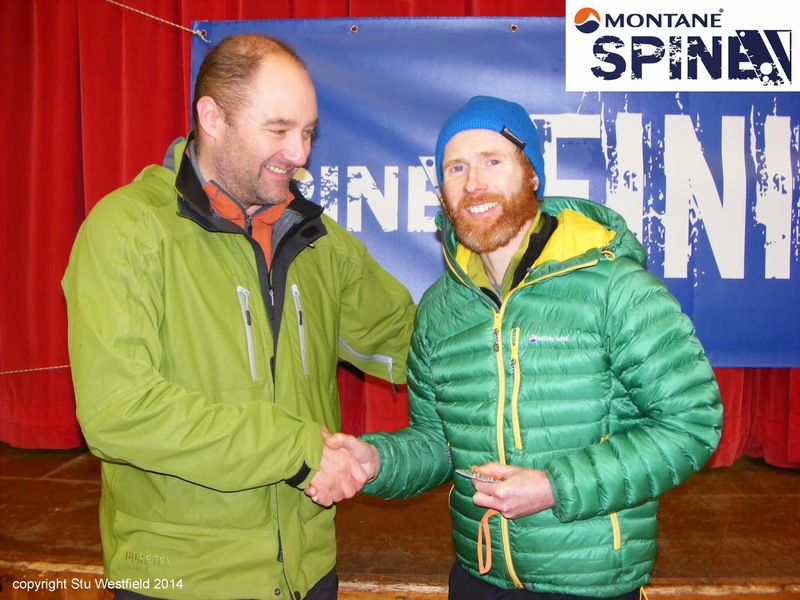 2012 Spine finisher Richard Lendon wrote an excellent blog on his comparison of the Spine Race with the Marathon Des Sables (which he also completed in 2012). Given that the MdS is still spoken of as the hardest footrace on earth, Richard's first hand assessment that The Spine is harder should serve as fair warning to the under-prepared. Lets put the environmental factors into context. The United Kingdom has one of the highest lapse rates on earth. (approx 1 degree C drop per 100m in height). This extreme rate of temperature drop with altitude and is due to our wet maritime climate. It is why on a British hill, which is so small in comparison to the Alps (where the montaine air is dry) people can get into hypothermic difficulties very quickly. A brief word on course reccies. It could be said that 2013 was the year of the course reccie. Many racers spent lots of hours on the Pennine Way. I would not argue against this from a hill fitness perspective. But, many of the racers who reccied the trail did not finish the Spine. I believe the reasons for this are as follows: A spring, summer or autumn reccie does not effectively simulate winter conditions. Also I would question the usefulness of a reccie if the terrain will be covered at night time during the race. So by all means use reccies to help with fitness and familiarisation on a few sections of the course, but also combine an element of skills learning or practice with the exercise. Eg night nav, efficient putting up of tent in strong wind or cooking a meal. The Spine is no ordinary ultra, it is a race which requires expedition skills, a high degree of self management and a calm, sorted mindset. 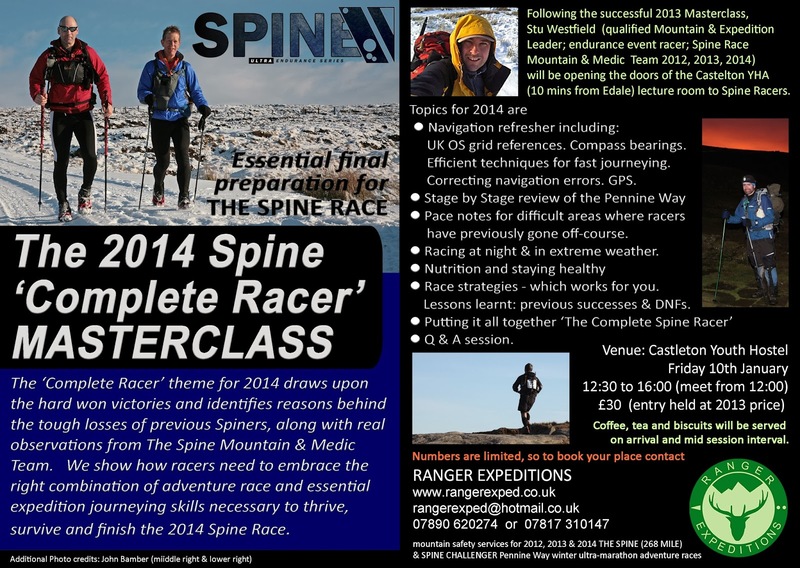 From this I developed (through Ranger Expeditions) the pre-race Spine Masterclass event, which this year took the theme of 'The Complete Racer'. Eleven Spiner's and Challengers joined us on the Friday afternoon before the race. This was not the time to suggest big changes to strategy, rather we offered a confidence building session, with plenty of small hints, tips and course specific navigation advice the sum of which all added to big savings in energy expenditure. Enabling racers to maximise their potential and journey further than would otherwise have been possible. I promised I would return to Jon's story. Jon's ultra running achievements and athletic ability is beyond question. Following his two Spine DNFs, he had the self-awareness to recognise that he needed to acquire expedition and navigation skills to achieve his much sought after finish. I provided 1:1 training and mentoring in terrain which posed the same navigational challenges that are encountered on the Spine. We also included a night nav session in dense woodland to simulate the forests around Bellingham (CP5), which have a certain reputation for contributing to off-course errors. "I just had the absolute belief that I was going to finish this year and wasn't going to let anything stop me. On a practical level we started really slowly and slept in 90 minute cycles making sure we ate every 30 minutes. I made sure I didn't get sucked into other people races, by day 3 we had caught a lot of people who went off quickly. Physically there was never a point where I felt I couldn't carry on and I had put in a solid year of training. We only made one real nav error on the last day, so being confident in night nav was a big difference from last year." Making a return were John Bamber, Paul Shorrock and Mist SAR dog, looking after racers in their famous style at Greg's Hut on Crossfell, CP1.5 Malham Tarn and various other road heads. Aspirant mountain leader Ben Taylor was without doubt the find of the week. His combination of enthusiasm and solid hill skills made him an instantly a valued member of the team. Having seen him at work on the mountains, I am convinced he will make an excellent leader. And myself Stu Westfield plus Peter Lowton (Ranger Expedtions). We were joined and ably assisted at various stages on the hill by returning Spiners and members of the Exile Medics Team. This year Ben and I, were involved in various mountain action during the race before co-incidence happily saw us again at Checkpoint 5. We arrived to find that Ally and Amanda had done a superb job getting the site set up organised and running slickly. But they had done so at the cost of sleep, so I suggested the Safety Team could look after things while they rested. There were a lot of racers due in the coming hours and with our Mountain Leader hats on the machine continued with us calculating projecting arrivals with a range of pace times and doing the same for departures. This information allowed us to deploy road head monitoring staff (enter Andrew Hayes with Shadow the husky and Flip Owen) and then swap them out for rest time and refreshment back at the CP. My mountain duties on The Spine concluded with sweeping back along the Cheviot ridge to check on racers as we passed them. I was joined by Ben, 2013 Spiner Russ Swift and Dr Matt Edwards. We paused to brew up tea, hot soup, cheese and crackers at Auchope Refuge (sadly no port or single malt yet for us on duty). In between banks of hill fog the sky was such a wonderfully clear moonlit night that we navigated without head torches for some of our trek to Mozie Law. Along the way we checked on the the welfare of all the remaining racers, stopping to top up their water, offer some route finding advice,changing their batteries etc. For me, the remarkable fact of the 2014 Spine Race is the number of finishers who arrived at Kirk Yetholm looking so fit and fresh as if they had just gone for a day's bimble in the hills. Their strategy and self-care had worked so well, I'm sure many could have raced onwards for another 100 miles. From the first running in 2012, The Spine Race became an instant classic. But as the race now matures, people are learning more about what it takes to become a Spiner. 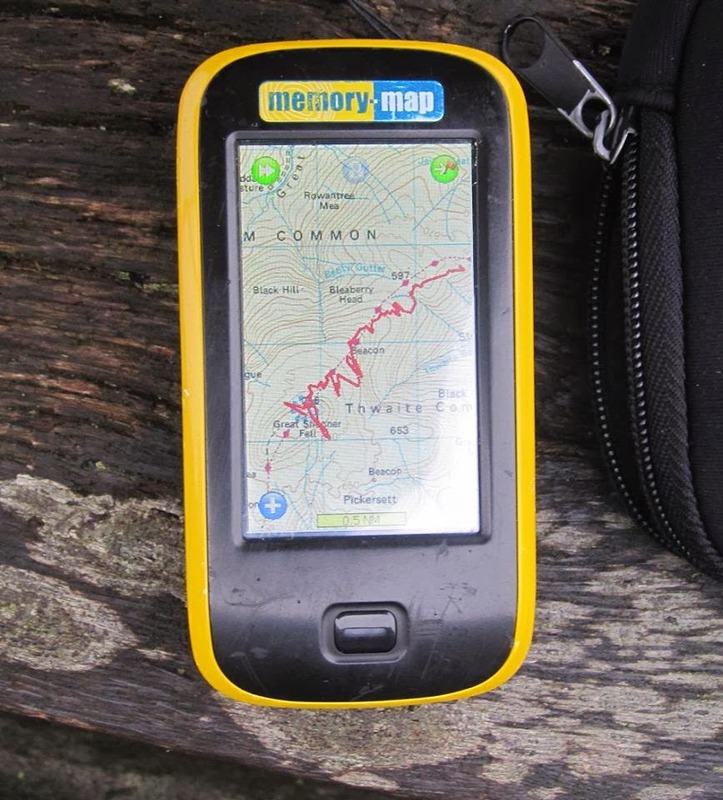 In the context of the investment a competitor makes (time, money, energy, emotion) the cost of a couple of days race specific navigation & hill skills training with a qualified mountain professional is relatively inexpensive. The benefit of acquiring and refining these skills has proven to make all the difference, not just to Spine performance, but also to competitiveness in other shorter mountain races such as the Ranger Ultras - Peaks Vales Moors & Trails Series. Whether you're a navigation beginner or improver, join the growing number of racers who have joined a Ranger Expeditions navigation & hill skills course or enjoyed 1:1 training to help them on the road to success in The Spine.